The stench of burning rubber, heated metal and roasted cargo hung in the afternoon air long after the 5:00 p.m. crash of the 18-wheeler. Commuters using I-84 found their typically-slow, 5:00 p.m. drive home slam to a standstill on June 22. And, Parkrose neighbors and business people were surprised to look up and see a giant plume of thick, black smoke belching from the area where the Banfield Freeway crosses over NE 122nd Avenue. The explosions also caught the attention of people at Rossi Farm, two blocks away, at NE Shaver St.
An eyewitness to the narrow escape of the flaming truck’s driver was Jeff Schumacher, a driver with Jet Delivery Air Freight. His truck had broken down on the I-84 exit ramp at 122nd Ave.
Empting each fire engine’s 1,000 gallon tank in turn, firefighters doused the inferno. Just before the sixth fire engine’s tank ran dry, crews were able to connect a 2-inch hose to a hydrant more than two blocks away. The fire was initially attacked with water carried on the fire engines, but that supply is limited, and a hose was stretched 700 ft. to the closest hydrant to provide water for a prolonged fire attack. 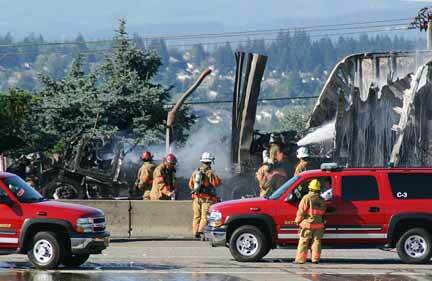 “The fire in the truck was brought under control at 5:35 p.m.,” Oswalt told us. 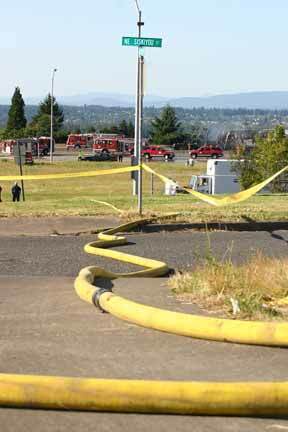 In all, 35 firefighters were called to battle the fire, in six engines from both Portland and Gresham. Four people were transported to local hospitals with non-life threatening injuries. One firefighter was treated at the scene for heat exhaustion, and was transported to the hospital for further evaluation. The fire burned so intensely that after the second fuel tank boiled and exploded, the only recognizable features of the tractor were its exhaust pipe and frame. Police say the driver of the now-charred big rig, 57-year-old Richard Shoemate, was to blame in the spectacular crash–for driving too fast, following too closely, and not being prepared for heavy, slow traffic as he headed westbound on I-84. Shoemate was cited both for “Following Too Closely” and “Careless Driving”, for his role in the collision.